Charlie graduated with a Bachelor of Business Administration (BBA) from The University of Texas in 1977 and obtained his Doctorate of Jurisprudence from St. Mary's University School of Law in January of 2007. After his BBA, he immediately went to work in the Engineering and Construction Department of GTE (Now Verizon), then got a better offer from Southwestern Bell (Now AT&T). After doing about 8 years in the corporate world he left to become a partner in two businesses with his teenage friend, Brian Mahoney, and reciprocal Best Men at each of their weddings, both recently celebrating their 40th Wedding Anniversaries. Charlie was the Real Estate Broker, Brian the builder for their companies Texas Real Estate and Mahoney Custom Homes. While surviving the mid to late 80's crash in the market they amicably split paths in 1989. He began his 3rd career as a Vice President of Marketing for Canyon Lake Telecommunications Company CSI. He then went on to form his own telecom companies working with many others in Payphone Providers Inc., COINLINK LLC, ComChoice Inc., Clipper Telecommunications Inc., TURNKEY PREPAID LLC, and CBS LLC. He was an owner and Vice President and COO of PPI, President and Chairman of the Board of the other companies. From 1989 to 2002 he was the primary force in companies that specialized in payphones, switches, hotel systems, and other services including a Joint Venture with AT&T and Kodak, to provide the fiber for all Texas Department of Public Safety's software and hardware for the DPS Driver's License Department still in use today. Testifying before the Oklahoma Corporation Commission, Sullivan played a primary role in opening the payphone market to competition in Oklahoma. The interaction with then Monopoly Southwestern Bell Inc. resulted in numerous lawsuits being filed by both SWB and Charlie's companies. The litigation began in 1993 and continued until 2002. The Telecom vs SW Bell Anti-Trust case filed in 1998 in Federal District Court went all the way to the Supreme Court. Sullivan's COINLINK LLC and 8 other Plaintiffs prevailed, ultimately being awarded over $7M by the Oklahoma City Jury. Under the Antitrust Law the damages were trebled and SWB was ordered to pay attorney's fees at every level of Appeal. The total exceeded $30M, about 1/2 going to attorney's fees and other costs. In the Clinton years the Income Tax Rate was another half. Another 3 lawsuits ensued where Sullivan was the Plaintiff's liaison working directly with the attorneys including the famed Susman Godfrey law firm, Buzbee Law Firm, and Bill Campbell from Dallas. All those cases settled confidentially, as well as a suit SWB had filed against Comchioce and him personally. Seeing the wireless writing on the wall, Charlie sold his company and retired in 2002. After realizing retirement was not a good fit, at 49 years old Sullivan returned to school in 2004. He had always thought of being a lawyer even taking the LSAT and being accepted to South Texas College of Law while working for Bell. Through the years Charlie also owned and operated 7 Subway Sandwich Shops, 4 Hawaiian Shaved Ice Trailers, Cedar Terrace Condominiums, as well as Real Estate Development Company BATM LLC. Striking out on his own with SULLIVAN & ASSOCIATES PLLC, Charlie entered general practice and did a bit of everything, criminal defense, civil litigation, family, real estate, juvenile, custody, probate, guardianship, trusts, personal injury, business, contracts and corporate work. Charlie’s experience in Estate Planning, Real Estate, and past participation in Business Civil Litigation led him to his primary interest in Plaintiff litigation. This is intertwined with all areas of his practice. Our commitment is to keep our clients out of litigation before it starts, but when it is time to fight the Battle we are prepared for WAR. A real COURTROOM BATTLE and a Forrest Gump feather led to the ultimate formation of JONES SULLIVAN LAW. Years ago, his current partner, Gina Jones, and Charlie had duked it out in Court. Afterward they licked their wounds and met for a beer at the Old Liberty Bistro below her office in the Old City Hall Building. They became fast friends and a few days later Charlie saw her Law License. Gina Marie Applewhite Jones. Charlie asked if she knew Mary Applewhite from Clear Lake. She said you mean my favorite Aunt. Turns out Charlie had known her Aunt for 45 years or more. She was a very good friend and fellow Clear Creek Cavalier with Charlie’s wife, Ann, as a Junior. Her senior year Mary was a member of the first graduating class of the newly formed Clear Lake High School. Ann stayed at Clear Creek as Captain of the Cavalier Dance Team. How could they miss? Gina and Charlie bring their entrepreneurship characteristics to the firm as they are always looking outside the box. By combining their unique talents, intelligence, experience; as well as their shared passion for truth and justice for all, they have created the ideal law firm to handle all your legal challenges. Charlie and his wife; local Certified Public Accountant, Ann Sullivan, were childhood sweethearts who dated while at Clear Creek High School. Charlie graduating from Clear Creek in 1972, and Ann graduating in 1973. Both attended The University of Texas at Austin where she graduated from The Red McCombs Business School with a Bachelor’s Degree in Business Administration. She attended Graduate School at University of Houston, Clear Lake to obtain hours of Accounting needed to sit for the CPA exam. She obtained her CPA in 1986 and has been operating her own practice at Canyon Lake since then, with her partner Amy Shear, CPA joining her firm in 1997. 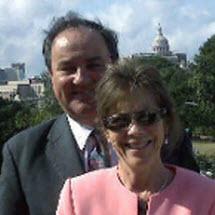 Ann and Charlie have two children Dr. Cristin Dugan and Kevin Sullivan. They have 4 grandchildren Jolea, Landry, Cambry, and Oliver. Family vacations have been from snow skiing to fishing in the Florida Keys and Emerald Coast of Florida, as well as the Gulf Coast and Lakes of Texas. Charlie and Ann enjoy playing golf, and their golf vacations have included the historic courses in Scotland to picturesque golf courses in Hawaii and Colorado. Charlie is a devoted fisherman as well. He loves all sports. The Longhorns football and baseball, Dallas Cowboys, San Antonio Spurs and, the Houston Astros are his favorite college and pro teams. Charles W. Sullivan (forever little Charlie, even though quite a bit bigger) was born in 1954. His father, Charles E. Sullivan (big Charlie) was born in 1929 and was a Nuclear Physicist and Engineer. After joining the Navy at 16, in 1945, he had essentially 4 careers. One as a football coach (he had played college football at Southeastern State University in Durant, Oklahoma). He then worked as a Petroleum Engineer for Halliburton, before beginning his primary career as an Aerospace Engineer for Boeing. After a 2-year stint working on the B 52 at SAC in Wichita, Kansas, Boeing transferred him to the manned spacecraft program where he spent many years working on the Mercury, Gemini, and primarily the Apollo space programs for NASA. This involved short stints in NASA locations in Houston, Huntsville, Alabama, Louisiana, Irving, before landing in Seabrook, Texas (near NASA's famed Space Center) in 1966. This could explain what some refer to as Little Charlie's accent. After spending years 3 through 12 primarily in the South his accent is a unique Gumbo of mid America, deep south and Texas which is considered his home. Big Charlie made the decision to end his career with NASA after they made what he felt was a mistake in converting to a solid fuel rocket. He felt the change was a dangerous one. He returned to his roots became a successful Independent Engineer and Real Estate developer. His mother, Lois, was a homemaker, who worked for and retired from GAF Corporation when they returned to Oklahoma. They lived in their home on Lake Texoma near Durant for many happy years. Sadly, Big Charlie passed away in October of 2017, at the age of 88. Lois moved to Canyon Lake to be close to family in 2018. She passed away in May of 2018, a few days short of her 93rd birthday. They are reunited with Charlie and Ann’s granddaughter, Tinsley, in Heaven.